Blizzard has added some things to the Brawler’s Guild. One of which makes it impossible for me to fight there. They added the requirement that you have to be invited to the Brawler’s Guild in order to fight there. Only for some reason they didn’t send me the invite (See the update below). I’m assuming that is because I’m already Rank 5 in the guild. Why send an invite to someone whose already ranked, right? Hopefully they will fix that little error soon. In the mean time I watch some other people fight some new bosses…..including Unguloxx the Murderaffe!!! I also found it interesting that you can watch the zeppelins fly over the arena in a building that is covered when you look at it from the outside. UPDATE: MMO-Champion comes through again with the updated patch notes…. I checked out the Black market Auction House. The invites are listed at a starting price of 250,000 gold!!! I guess I’ll be looking for an invite from someone. Hopefully that price will come down before the patch goes live. That’s a little steep. UPDATE #2: (11/6/12) Blizzard got the message. 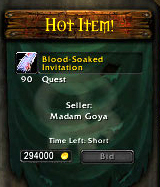 Invites are showing up on the BMAH for as little as 5K gold. Just remember, there is no buyout on BMAH items you have to bid and others can out bid you. Here is what Ghostcrawler had to say on the subject…..
Why put Brawler’s Guild pass on the BMAH? Now I’ll just never see it because I hate the BMAH. I expect everyone who wants to brawl will be able to. Just not the day the patch goes live. Slow down, as the Pandaren say. So maybe as time goes by it will be easier to get in? 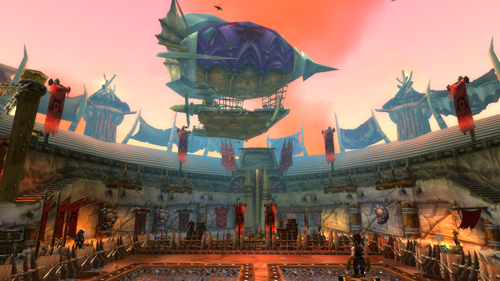 Update #3 (11/27/12): Invitations will also drop from certain Alliance and Horde NPCs. Nethaera Said: With the latest patch, 5.1 “Landfall”, we’ve introduced the new feature, the Brawler’s Guild. As wepreviously announced, entry into the Brawler’s Guild is by invitation only. 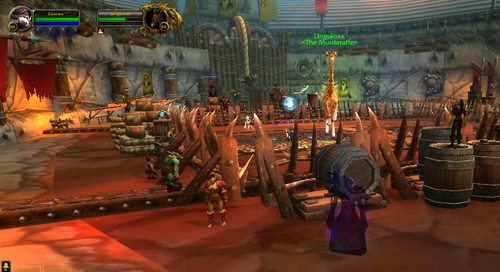 Invitations can be found on the black market auction house, by invitation from somebody within the guild, and occasionally as drops from certain Horde and Alliance NPCs. Before you rush to your realm’s black market auction house, we wanted to make you aware that invitations may not be available immediately upon realms going live, but should be showing up within the next 24 hours. We wish those of you who choose to take on this next challenge the best of luck in your endeavor. The patch is downloadable right now! Servers aren’t up yet though.